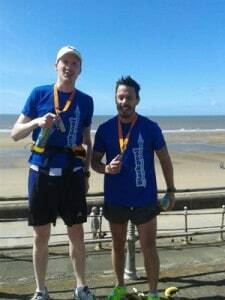 A massive congratulations is in order for our very own Tom Cosway and Matt Farrington, both from our Burnley office, who took part in this year’s Blackpool Marathon on Sunday 26th April raising money for local charity Pendleside Hospice. Matt and Tom both successfully completed the 26.2 mile race in excellent conditions, Matt finishing in 3:35:37 and 81st place shortly followed by Tom completing in 3:43:58 and in 123rd place out of an incredible 750. The Fuel Card Services team is very proud of Matt and Tom for this truly outstanding achievement and their ambition to raise funds for a very worthy cause.